Last week you may have accidentally received a notification from Facebook asking you if you were okay following the bombing in Lahore, Pakistan—even if you were nowhere near Lahore, or the country of Pakistan. Users in the U.K. and in the U.S. tweeted screengrabs of Facebook push notifications and even SMS messages that were triggered as part of the Safety Check feature Facebook rolled out in 2014. People were worried, and even vaguely annoyed, to get such a serious alert on their phone, which Facebook blamed on a nonspecific “bug.” But barring a proven disaster resulting from the Safety Check, I think it’s a completely worthwhile and wonderful feature. Life is scary, and there’s nothing wrong with making use of a technological security blanket every now and then. When we first met, my fiance worked nights—and I did too, since we were essentially coworkers. But by the time we started dating, I had changed jobs and moved to schedule that was closer to the regular 9-5 grind. This was hard for a number of boring, self-indulgent reasons but most searingly because his late night commute made me clinically anxious on a near daily basis. Not right away, but eventually. After we moved in together it got a little worse. After he had an accident that kicked my anxiety into overdrive, it became unbearable. I stopped being able to sleep until he was home safe, which was difficult given that his job required him to take a 2 A.M. subway home, when trains are at their most unpredictable. A train ride—lasting between 30-60 minutes— is objectively not a particularly long time to be out of touch, but those nights were excruciating nonetheless. I imagined drifting off to sleep and waking up in the morning to find he’d never come home because something horrible had happened, and there were nights that I’d call my parents (yes at 2:45 A.M.) in a panic demanding answers they had no way of providing. Obsessing over his safety left me embarrassingly unhinged, even when I knew I had lost all perspective. Those days, we spent a lot of time focused on Stopping The Anxiety. This is not an unworthy goal—particularly for someone who’s afraid to fall asleep in blue jeans, lest they cut off circulation to my legs. While this sort of anxiety can seem humorous to people who don’t have to deal with it, there’s no doubting that the basic human want to know that your loved ones are safe is universal. And given our unusual circumstances, I learned that safety—especially late at night, in a big city—is a perfectly okay thing to be worried about. So, how do we assuage our fears without being overbearing? Smartphone technology that allows for monitoring, via things like parental tracking apps, is the sort of modern convenience that draws a lot of ire as evidence of overprotective parents fostering an over-coddled generation. That said, there’s no benefit beyond bravado to weathering reckless teen and young adult behavior without any sort of safety net. I’m not advocating for reading your kids’ text messages—although, do what you want? I’m not a parent—but there are a range of safety apps that exist for different scenarios. Some like Kitestring and Bugle are designed to be available only when you want them to be—they keep your friends at bay until there’s cause for concern. Both require you to confirm your safety every so often, or at the end of your pre-planned activity—if you’re out on a blind date or solo run, for example—and alert your emergency contacts if you fail to do so. Watch Over Me provides more comprehensive monitoring. It’ll track your GPS for a designated amount of time, alerting you to high crime areas and sending periodic check ins until you turn it off. Maybe all that sounds crazy invasive to you, which is fine. But even researching these apps now give me a sense of reassurance. All of them are limited—of course—both by the reality of how quickly an emergency can arise and their reliance on cellphone service. This makes them especially imperfect for those dealing with long pockets of time where they’ll be out of service—for example, subway riders or people who have to commute to work in under-serviced areas. Fortunately, my fiance switched to a job that had even worse hours, but covered the cost of a cab ride home. This was better, but still I suggested we try using the Companion app whenever it was that I first saw it covered in various news outlets. It’s marketed for college students who might be walking home alone from a party late at night. This is certainly a riskier scenario than a sober adult man taking a cab, but it works just as well for either case. The user enters his destination and selects from one of his contacts, who is sent a notification that allows them to track the user’s location. While the app is open, 911 is just one click away. 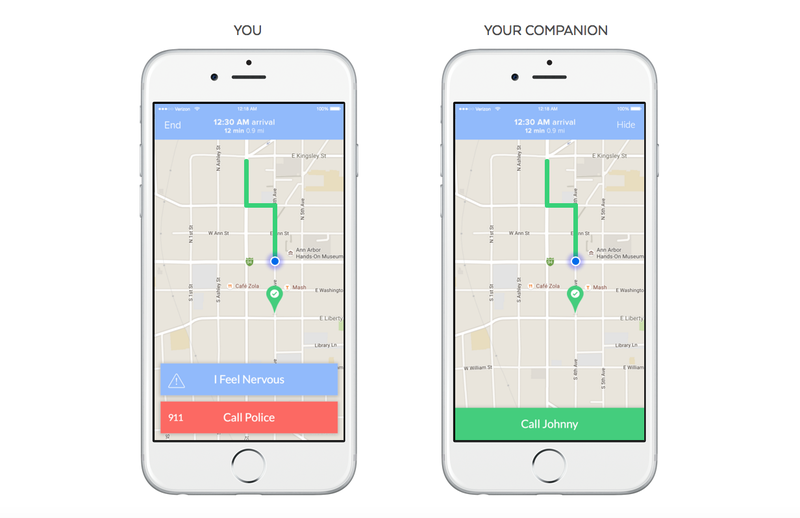 If the phone’s sensors detect any unusual behavior—it’s jostled suddenly or strays too far off track—the app asks the user to confirm that he is okay. If he fails to do so within 15 seconds, an alarm goes off. It’s glitchy, but it’s getting better. Sometimes it freezes and I have to text him to restart it. Sometimes it asks him if he’s okay after the cab hits a pothole. But I am eternally grateful that this technology exists. Tracking my partner’s whereabouts through his phone is a practice that is mocked easily and often. It’s also subject to frequent disparaging remarks that have no good will behind them at all. But honestly, it’s been nothing short of amazing for us—quickly and easily confirming that he’s okay without dwelling in anxiety prevents our relationship from devolving into a game of chicken I’m playing with my own worst fears—wondering every minute if it’s been long enough to check in again, and growing resentful in the process. This sort of technology is more about maintaining a peace of mind, and it’s not a psychological cure. But it’s much easier to work on my anxiety when it isn’t run through the gauntlet five nights out of the week. Besides, there’s no prize for being neurosis-free, so if technology offers to help me manage my fears, I’m going to take it up on that offer.